How to Properly Winterize Your Community Association. A Primer for Condo, Townhome and HOA Association Board Members. Chicago winters are unpredictable, and you just never know what is in store for us. Sometimes, the winter is unseasonably mild with little snow fall and temperatures often in the 50’s. Those winters feel like a cross between Spring and Fall. Whereas during other winters, old man winter slams us with harsh subzero temperatures and heavy frequent snow falls. Between the freezing cold and the endless snowfall, we often wonder what it would be like to live in a warmer climate during the winter months of Chicago. Regardless of what type of winter is in store for us, it is essential that you properly winterize your community association and home so that you are ready for any type of winter scenario. Ensure your home is ALWAYS heated during the winter months. Make sure the windows are closed when you leave. If temperatures are expected to drop below freezing, make sure to turn on the cold-water faucets to a trickle in the kitchen and bathroom fixtures served by exposed pipes. (pipes that you know don’t have the proper insulation or are installed directly against the exterior walls of your home. Keep the lower cabinet doors open under the kitchen and bathroom sinks. Make sure the garage doors are closed especially if you live in a home with an attached garage. If you rent, make sure to educate your tenants on these techniques. If your home is vacant, make sure you have someone stop by to winterize the unit by following the above steps. You might also consider turning the water off into the unit. Turn off and drain all outdoor water spigots. This is EXTREMELY important. This is the step most people forget. If you live in a condo association with a common area hot water or steam boiler heating system, make sure to have a qualified HVAC service contractor check out your system, clean it and turn it on to ensure the system is running smoothly. You may also consider conducting in-unit radiator inspections to check for radiator leaks particularly in the areas where there are control valves and air vents. These typically are the areas that leak most commonly. It is also possible that the radiator will leak in the main body but that is not as typical. These are simply visual inspections to ensure that there are no visible leaks. The sooner these types of leaks are identified, the better, as this will prevent a larger flooring and ceiling repair bill down the road. If the association has a common area furnace and/or if owners have their own in-unit furnaces, it is recommended that the furnace is inspected and that the filter is replaced. The filters should then be replaced every 3 months while the system is utilized. If your association has gutter cables, these should be turned on and checked to make sure that they are working. This is done by checking the cables and making sure that they warm up. They don’t get very warm, so it should be safe to simply touch them and ensure that they are working. If they don’t warm up, check the fuse panel and see if the circuit breaker has popped. Alternatively, some systems have an on and off switch that illuminate once the gutter cables are turned on. If your system has this setup, check to see if the switch illuminates once you turn them on. If you need further assistance, make sure to call a qualified electrical contractor for troubleshooting assistance. If your association has gutters, make sure that they are cleaned out and ready for winter. This is applicable whether the association has one condo building or a collection of single-family homes in an HOA environment. Ensure you sign up for snow removal services as soon as possible to avoid over paying for services. You may also consider signing up for a 3-year agreement that can potentially save the association money. In addition, if your association has lobby areas and there is no maintenance staff on site, you may consider having buckets with salt and a small shovel placed in each lobby area. This will make it easy for someone at the association to sprinkle salt around the doorways of each entrance to prevent people from slipping and falling. If your association has a parking lot or roads within the community, make sure to communicate any specific details about where to park cars in the event there is a snow fall. This type of communication will vary from association to association. Regardless of whether your association has driveways, a parking lot or streets, it is advised that the board communicate general snow removal information to each homeowner so that they know what type of snow service to expect from the snow removal vendor once the snow starts to fly. In other words, did the association sign a zero-tolerance agreement where the vendor will come out every time there is any type of snow fall or precipitation, or will the vendor only come out after 2” or greater of snow fall. Check all common area doors for drafts around the door frames and at the bottom of the doors. Install door sweeps, weather stripping and/or door closers if appropriate. This will help minimize cold air from entering common areas and into homeowner’s units. In the event there is an emergency event, it is important that you have phone numbers of the vendors at your fingertips. It is also important to know which vendors offer after hour emergency response services. For example, not all plumbers offer after hour support. 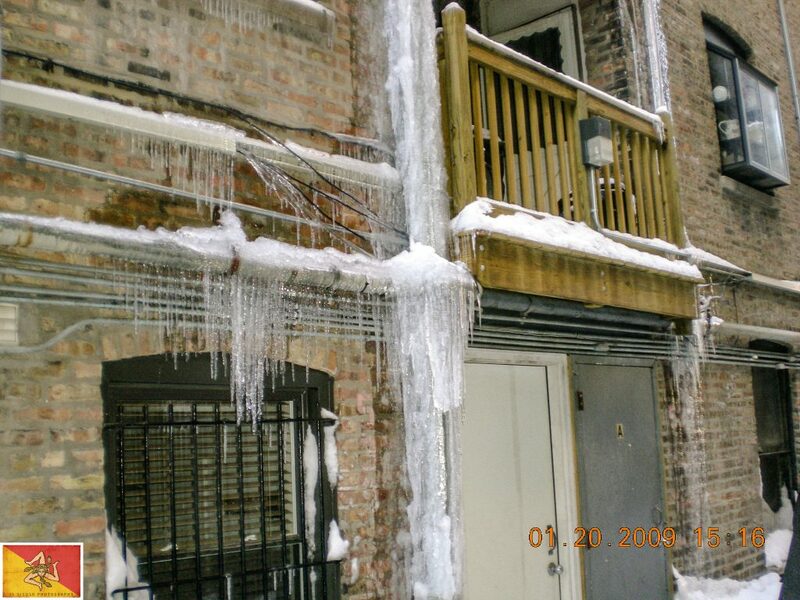 Now that winter is soon upon us, it is always better to be over prepared for Chicago winters rather than getting caught unprepared and suffering the consequences. Take the time to thoroughly plan and prepare and the homeowners of your community association will appreciate the effort put into it. Better yet, you might even end up saving the association lots of money and preventing lots of homeowner headaches by following these winterization techniques.